PRIO is a partner in a new global homicide monitor that has just been published. 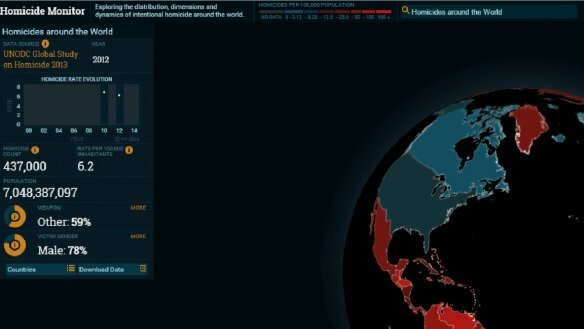 Hosted by the Igarapé Institute in Brazil, the monitor presents counts and estimates of global homicide over the period 2000-2014 and is intended to provoke reflection and stimulate debate. The Monitor reports 437,000 homicides in 2012, the last year for which global estimates are available. A small number of countries account for a disproportionately large share of the global burden of homicide. For example, it is estimated that 2 out of every 5 people murdered around the world live in Brazil, Colombia, Mexico, Venezuela or South Africa. The Homicide Monitor can be found here: http://homicide.igarape.org.br/. It is based upon technology developed by Google in conjunction with PRIO and the Igarapé Institute for the Mapping Arms Data project that is hosted by PRIO and which visualizes the trade in small arms and their ammunition. The visualization presents trends that users may find surprising. For example, the USA is often portrayed as a particularly violent country. Its homicide rate is higher then found in Western Europe or similar states such as Canada, Australia or Japan. But on a global scale the USA in 2012 had a low level of homicide of 4.7 per 100 000 population. Rates five times higher can be found in many nearby countries in Central America and the Caribbean. Other eye-catching aspects of research on homicide are presented below. The estimated 437,000 homicides in 2012 exceeded by far estimates of battle deaths in warfare. The recently published Global Burden of Armed Violence states that over the period 2007-12 homicide accounted for 74 per cent of all violent deaths. To put the totals into context, the Uppsala University Conflict Data Project has a yearly updated ‘Battle-Related Deaths Dataset’ that details 37 992 battle deaths in 2012. That total was exceeded by the 56 337 homicides in Brazil alone in that year (though warfare does cause significant ‘indirect’ deaths from causes such as disease or famine). The countries with the highest levels of homicide experience violent deaths at a similar or higher level to states in which there are wars. The 16 072 people murdered in Venezuela in 2012 is actually higher than the Uppsala estimate of battle deaths in Syria for that year (the bloodiest conflict in that year according to the Uppsala dataset). Overall, the highest levels of homicide are found in Latin America and the Caribbean, which is the location of about one third of all homicides, but the region only has 8 per cent of the world’s population. Honduras was the country with the highest level of violence in 2012 (the latest year for which comprehensive data is available), followed by Venezuela, Belize, Jamaica and El Salvador. The Monitor shows that concerning homicide, countries with Muslim majorities are not exceptionally violent. No countries with Muslim majorities are among the most violent places with over 30 homicides per 100 000, and indeed some, such as Indonesia, have the lowest rates of homicide. Certainly, political violence and warfare can be found in Muslim countries (and the wars in Syria, Iraq or Afghanistan are particularly bloody), but that is one form of violence. The picture is very different when one focuses upon homicide. Far more men are murdered than women. The overall level of homicide tracks the proportion of male victims. In Honduras, which has the highest 2102 rate of 85 murders per 100 000 people, 92% of the victims are male. In Japan, with one of the lowest rates of 0.3 per 100 000, male deaths in 2011 were a minority at just 47%. This relationship between the overall level of homicide and proportion of male victims has been highlighted by criminologists for decades. The gender disparity can be explained by homicide occurring in very different contexts. In countries in which there are low overall levels of murders a large proportion of killings occur within families, and so there are a relatively high proportion of female victims. Where there are much higher levels of homicide, killings tend to take place in public places involving strangers or acquaintances – for example in fights between gang members – who are usually male. In general, states with very high levels of homicide (above 30 per 100 000) also have a high proportion of murders committed with firearms. The Homicide Monitor lists 12 states with a homicide rate of over 30 per 100 000. Of these, we have data on the proportion of firearms used for seven of them. In all those seven firearms accounted for a clear majority of all deaths, with the average of all states being 76.6 per cent. Honduras, Jamaica and El Salvador have some of the highest rates of homicide in the world, and in 2012 firearms are used in 83, 70.8 and 62.8 percent of homicides (respectively). Nevertheless, the relationship is more complex at lower levels of homicide, as some states, such as the USA, have high levels of firearm homicide victims but on a global scale low homicide rates. As well as highlighting all the places where we have data, the Homicide Monitor also shows us where there are gaps. In particular, for most of sub-Saharan Africa, and other developing countries, we only have data for one year (2012), and that is just an estimate rather than an actual count of all homicides. There is a clear need to improve data collection and reporting in many of the poorest countries. At present we have a patchy picture of the homicide rate, and more importantly trends, in most of the least developed countries. This gap is particularly relevant as the Sustainable Development Goals (successors to the Millennium development goals) look likely to include a worldwide aspiration to promote peaceful and inclusive societies. Such a very laudable goal presents problems in how to measure whether and where progress has been made, something that would clearly be affected by the level of homicide in each country. Is the world getting less violent? The data gaps also highlight a key issue for the ongoing debate as to whether the world is getting less violent. A key data gap concerns the history of homicide, as well as its current extent in developing countries. At roughly three quarters of all contemporary violent deaths, long term trends in worldwide homicide clearly have a key influence in our understanding of whether the world has gotten more peaceful. Unfortunately, we don’t have a trend line for the long term global homicide trend. The UN Office on Drugs and Crime has compiled homicide trends from 1955 to for the Americas, Europe, and Asia and Oceania, however they are only based upon 5, 15, and 3 countries (respectively), not enough to establish a global picture. It has been possible to establish in Western Europe and the USA a long term decline in homicide that took place over hundreds of years. However, we currently lack sufficient data to chart such long term trends in the rest of the world. More data is available for recent years, but that tells us little about the long term trend. We know far more about the history of warfare over hundreds of years than we do about homicide, and the incidence and lethality of warfare has declined over the long run. This is unsurprising as wars are major events that are written about and recorded. What we need is to try to develop much more widespread historical data on homicide.